Make music on a medieval instrument that you built yourself. If you're someone who enjoys making music, then imagine the wonder of playing it on an instrument that you built yourself. That's easier than you might think, with this extraordinary DIY kit that lets you construct a working model of a 16th century hurdy-gurdy. Beautifully decorated with medieval flourishes, the wooden pieces are easily popped out from sheets of pre-cut plywood and can be assembled without nails or glue. After it's complete, use the included strings and rosin to tune up your new instrument and play a tune. Simply turn the crank to make it play, and press the six buttons along the neck to change the pitch. Whether you play it or display it (or both), it's sure to provide a lasting sense of pride and accomplishment. Made in Ukraine. I bought this for my husband's birthday, and was worried about how it would turn out. He spent 2 days in my floor playing with it! He had fun building it AND trying to figure out how to play it. 10/10 would buy again! Our 12 year old, who is quite determined and proficient, took great joy in constructing this model of a hurdy gurdy. 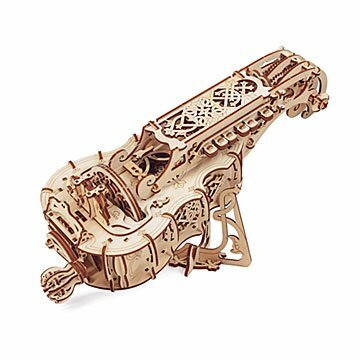 Elegant and elaborate (gears within gears, and decorative flourishes) this 100+ piece kit comes together beautifully- all without glue! The directions are easy to follow, so if you're the type that spends evenings putting puzzles or legos together, you'll be entranced by this kit. I especially like that the wood is doubly thick, so it's sturdy enough to have kids play around with. This is well worth the price. I would like the makers to consider making an orrery kit too!